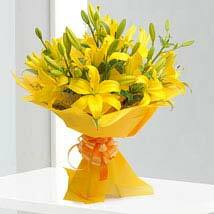 A bouquet of 10 Lily Flowers can be a bright and cheerful gift. These yellow lilies represents the symbol of good health and healing. This vibrant bunch of yellow lilies are wrapped in an exotic yellow paper and tied with an orange ribbon bow. Send this pretty flower bouquet to your loved ones to add magic and positive energy in their life. Pink Roses are the example of grace, elegance, appreciation, & poetic romance. 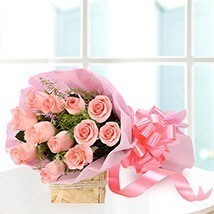 This bouquet of 12 pink roses definitely describes all the features of pink roses. These pink roses are wrapped with a pretty pink sheet and tied with a pink bow, which makes it a colorful gift for the receiver. This beautiful bouquet can be presented to your loved one on their celebratory occasions. Carnation is a historically rich, traditional and meaningful flower choice. 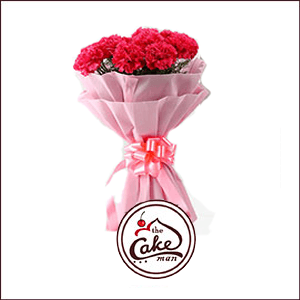 A bouquet of red carnation expresses admiration, deep love and affection for your loved ones. Our Carnation Bouquet has a bunch of pretty red carnations and all are beautifully packed in a pink paper and tied with a cute pink bow. Order this elegant Carnation Bouquet to melt your partner’s heart and strengthen your relation. Red Roses are the symbol of true love, passion, and commitment. These red roses will definitely speak for the unsaid passionate words of yours. This beautiful bunch of red rose bouquet is packed in a pretty red wrapping paper and tied with a red bow to give it a more elegant look. This bunch is suitable to be given to anyone whom you love and respect. 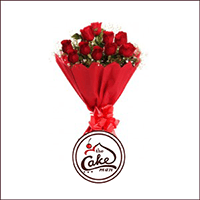 Make them feel special in their precious days by this amazing Red Roses Bunch and fill the day with happiness.